The moon moves around the Earth along an elongated, elliptical orbit, making one revolution in a month. 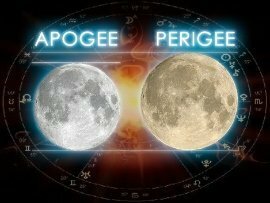 Accordingly, once a month it approaches our planet and passes the point of perigee, and once a month it moves away from the Earth, thereby passing the point of apogee. The term "perigee" is derived from the Greek words περί "peri" - around, near, near, and Gaia Γαία - Earth and means that the mutual distance between the Moon and the Earth at this point of the orbit is minimal. The Perigee of the Moon ranges from 356,400 to 370,400 kilometers. The term "apogee" comes from the Greek words από "apo" - from, from, and Gaia Γαία - Earth and means that the mutual distance between the Moon and the Earth at this point of the orbit is maximized. The apogee of the Moon is from 404,000 to 406,700 km. City New York.